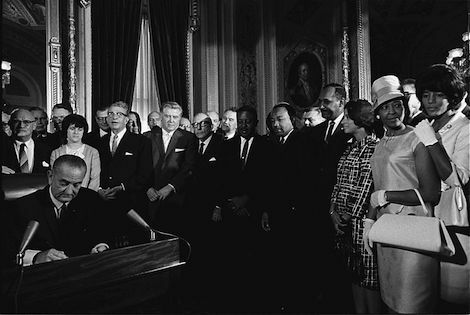 Lyndon B. Johnson signed the Voting Rights Act of 1965 into law 50 years ago today. Here’s a crucial portion of what he had to say when he spoke to a joint session of Congress on the legislation a few months earlier, in the wake of the violence against voting rights marchers in Selma, Alabama. Sure, there will be bogus “excuses” for restricting the franchise, like the phantom menace of “voter fraud.” And there may be legitimate but puny competing priorities like cost and state or local prerogatives. But please let’s don’t forget how such rationalizations helped support the edifice of white supremacy for so very long, until the national conscience was aroused by the events in Selma. It’s clear a lot of people, including the leaders of one of our two major parties and a majority of the U.S. Supreme Court, really have forgotten or figure backsliding on voting rights can be justified by the many blessings that will allegedly flow from their consolidation of political power. That’s precisely what LBJ warned us about over a half century ago, and what his successor in the White House will warn us of again today.